This 'Mofrel' technology is a designer's dream come true. It's safe to say that we're all familiar with the term "3D printing" by now, but "2.5D printing?" As silly as it sounds, this may be a game changer for all the industrial designers out there. 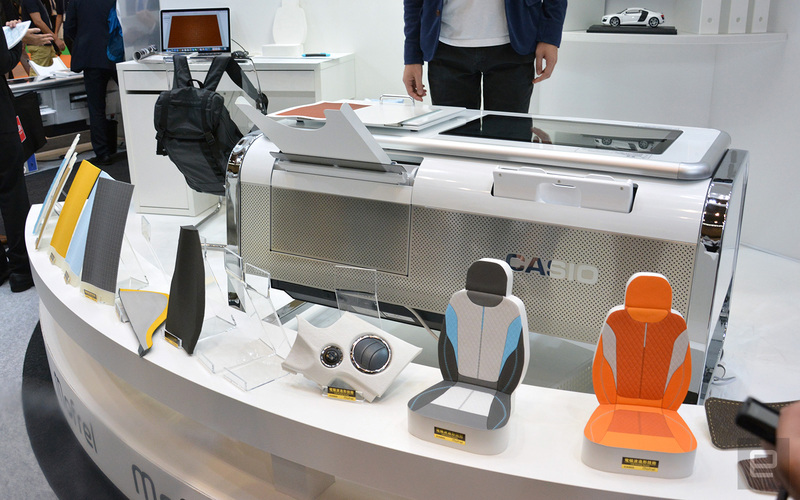 At CEATEC, Casio demoed this Mofrel printing technology that adds a range of textures to ordinary-looking sheets, before giving them the final touch with a 16-million-color inkjet. 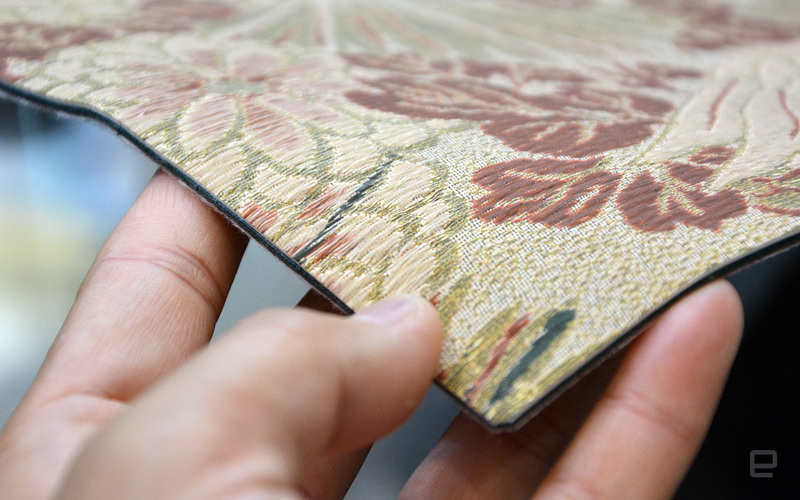 The printed samples looked and felt surprisingly convincing with a great level of detail -- down to the uneven surfaces and puffiness of leather, the subtle bumps on stitches and even the coarseness of embroidered fabrics (especially for kimono designs). Hard materials like wood, stone, brick and ceramic can also be mimicked, though some of these may require additional coating for hardness or shininess. The secret behind this trick lies within Casio's "digital sheets." These appear to be slightly thicker sheets of paper, but in fact, they contain a layer of micro powder between the inkjet layer and the paper or PET substrate. Each powder particle consists of a liquid hydrocarbon coated with a thermoplastic resin (acrylonitrile), and this combination expands when exposed to heat. The structure is still retained when heat is removed, leaving behind the mimicked texture on the sheet. To better control the texture formation, the texture pattern is first printed onto the sheet's top microfilm using carbon, then these infrared-absorbing carbon particles focus the heat onto the desired areas of the micro powder layer. 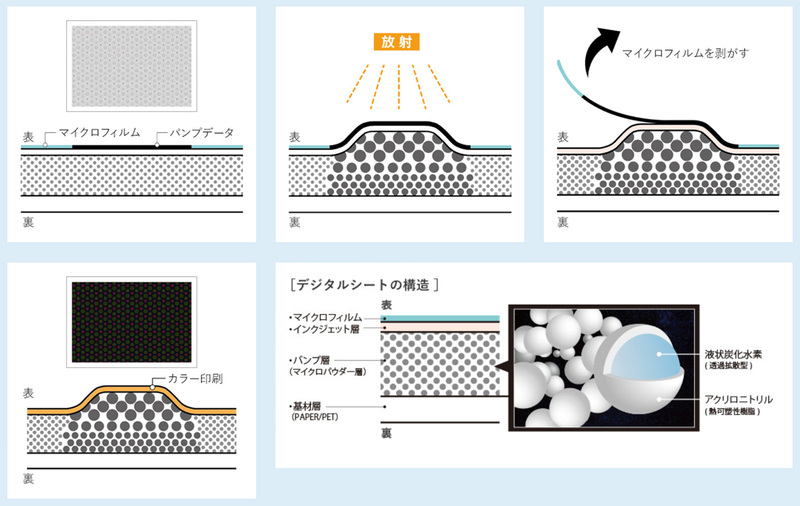 According to Casio Digital Art Division's Executive Officer Hideaki Terada, the sheet's expansion is currently capped at 1.7 mm thick for the sake of stability, but 2mm to 2.5mm is also technically possible -- albeit with some difficulty. The microfilm is then peeled off so that colors can be printed onto the textured surface i.e. the inkjet layer. The entire process takes around three to five minutes for a single-sided A4 "digital sheet," with each sheet costing around $10 (Terada might have been referring to the PET-based version for this). This may seem steep compared to ordinary sheets of paper, but considering the vast range of textures that this technology can simulate, it's actually a lot cheaper -- and faster -- than prototyping with the real materials. This is a dream come true for all sorts of designers. The printer also supports A3 sheets, and you can get double-sided sheets for both sizes (A4 would take about nine minutes to process), though prices for these are unknown. As for the Mofrel printer, the current version costs around a whopping five million yen, or about $44,400, and it'll be available as a B2B solution some time next year. That said, I was told that some top automobile makers as well as electronics companies got early access to Mofrel, and they are already using it for research and development. It goes without saying that this price point is a bit too much for us mere mortals, but Terada hinted that his team is already prototyping a consumer version, though we're still one to 1.5 years away from its debut.